Making a fresh batch of Dairy-Free Tofu Feta Cheese is as simple as one, two, three! Just take the tofu out of the package, rinse and drain off the water. Then slice the tofu into cubes. Finally, mix the zesty marinade, submerge the tofu cubes, cover and refrigerate for at least 2 hours. It will taste best in about two to three days. This vegan cheese recipe is ridiculously easy, and there are so many ways to enjoy it! 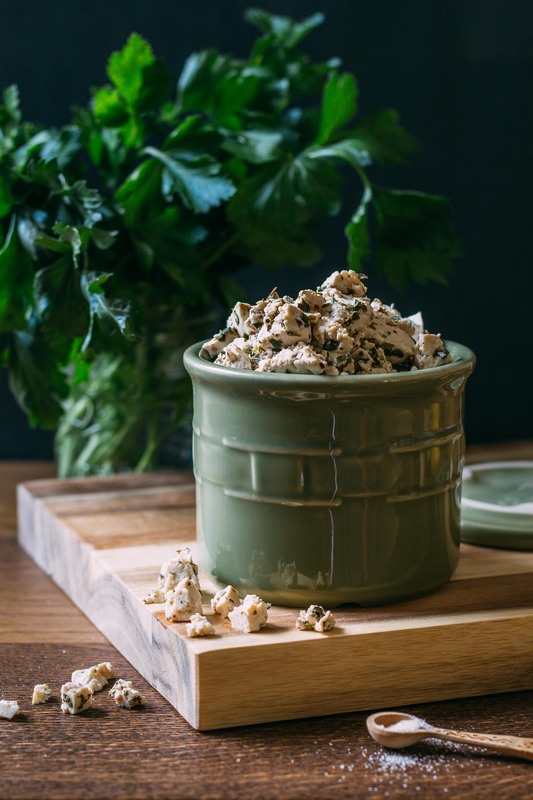 The difference between my recipe and many of the others you’ll find for plant-based Dairy-Free Tofu Feta Cheese is that I choose to use fresh herbs in addition to dried. I LOVE using fresh herbs whenever I can because of their inviting aroma, flavor, and nutrients. In this recipe, you’ll find both oregano and thyme. Did you know that oregano can protect the immune system and prevent the onset of chronic diseases? 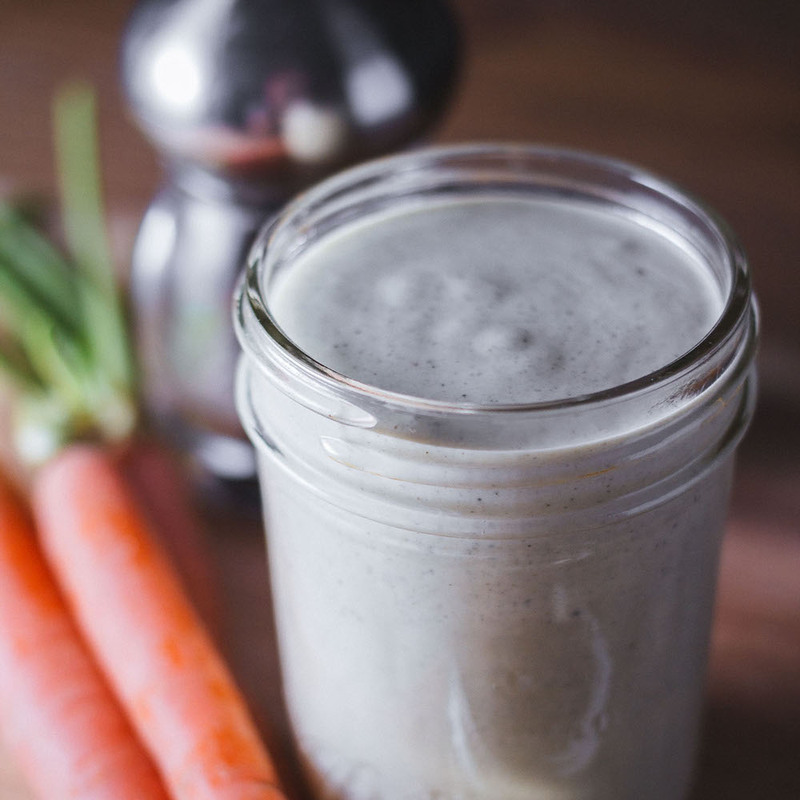 It can also improve digestion, detoxify the body, strengthen your bones, improve your heart health, boost energy levels, and even protect against diabetes! The exciting benefits of thyme include its ability to relieve stress and reduce respiratory concerns. Thyme also improves heart health. And it boosts the strength of your immune system, protects against chronic diseases, stimulates blood flow, and prevent fungal infections. Oh, my! If you’re an herb nerd like me you may be asking yourself, what can’t these two aromatic herbs do? I could keep talking herbs for paragraphs on end but let’s move on to the beautiful flavor of plant-based feta! Dairy-Free Tofu Feta Cheese tastes tangy, creamy and crumbly, just like feta made from dairy. But Dairy-Free Tofu Feta Cheese delivers all of the tastes without all of the gross stuff found in random samplings of dairy products. I could go into detail in describing what is really in dairy products, but this is a delicious food post, and I do not wish to ruin your lovely, healthy, appetite. 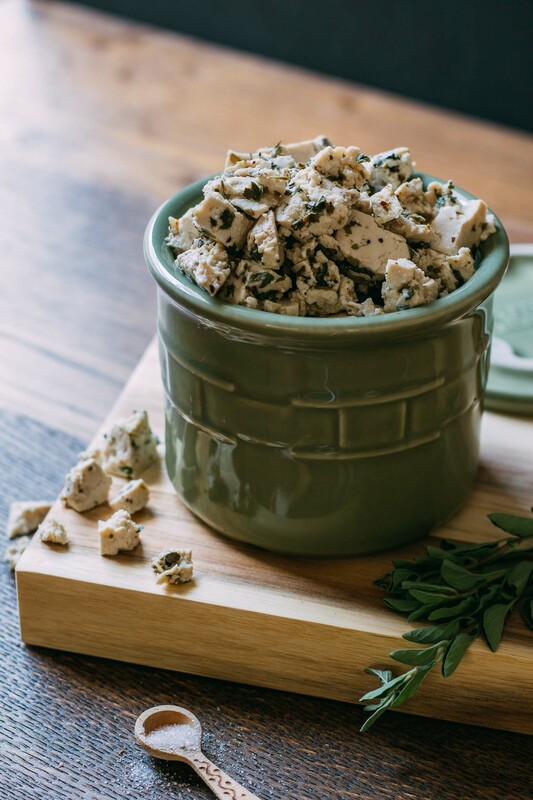 This plant-based vegan feta is a fabulous choice to top any salad filled with leafy greens. It also tastes terrific alongside roasted brussels-sprouts sprinkled with oil-free Vegan Fakin’ Bacon, and it is the STAR ingredient in my upcoming recipe for Oil-Free Greek Pasta Salad. Stay tuned – that recipe will be posting soon! 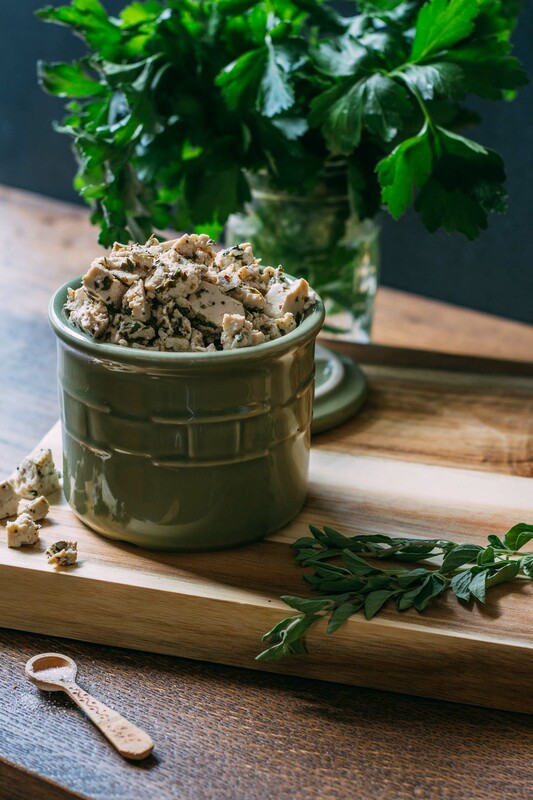 Be sure to PIN this recipe to keep it handy to share with your family and friends; and yes, once they’ve tasted Dairy-Free Tofu Feta Cheese, they WILL ask! And when you have the chance, take a moment to connect with me when you leave a kind comment to tell about your Dairy-Free Tofu Feta Cheese experience. 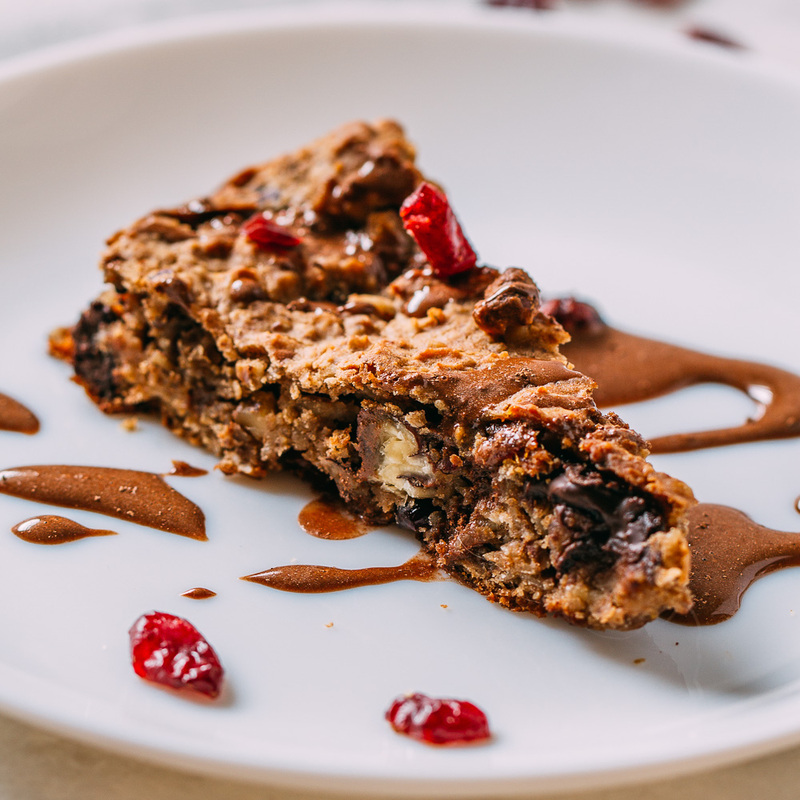 Creating healthy vegan plant-based recipes for you to enjoy is what I like to do – I’d love hearing from you! Yes, this is a vegan, plant-based, oil-free, dairy-free, gluten-free cheese recipe that tastes out of this world! And that’s not all! Hold on to your knickers, because Dairy-Free Tofu Feta Cheese is also naturally low in fat! Enjoy it on a bed of greens, piled on your favorite cracker, tossed into a pasta salad or rolled inside a veggie wrap. And it takes the leading role in my Oil-Free Greek Pasta Salad. This recipe makes enough for four very generous servings of about three and a half ounces each. First, rinse and press the tofu to prepare it to be brined/marinated. I use this tofu press that I received as a gift from my kiddos when I first started investigating plant-based cooking, and I LOVE it! There is nothing fancy about it but it gets the job done quickly, and it's easy to clean -gotta love that last part! If you do not have a tofu press, no problem! Here's how to press your tofu without an official tofu press. First, place a clean dish towel on a flat surface. Next, put the tofu on top of the towel and put another clean towel or paper towel on top of the tofu. Then place something substantial on top of that last towel that's covering the tofu such as a heavy pot, an iron skillet or a couple of cans or even books. With this method, allow the tofu to sit for at least a half an hour. Now that you've removed the extra liquid from your tofu, roughly cut or tear it into cube-like chunks. Don't worry about keeping things looking uniform - the more irregular, the more it presents like traditional feta. Next, mix all the marinade ingredients (the lemon juice, water, apple cider vinegar, thyme, and oregano) in a large jar or bowl. Add the tofu, cover and refrigerate for at least 2 hours. It will taste better and better as days go by but it is also pretty delicious just an hour or so after it hits the marinade. This recipe is practically effortless and delivers on flavor in a BIG way! 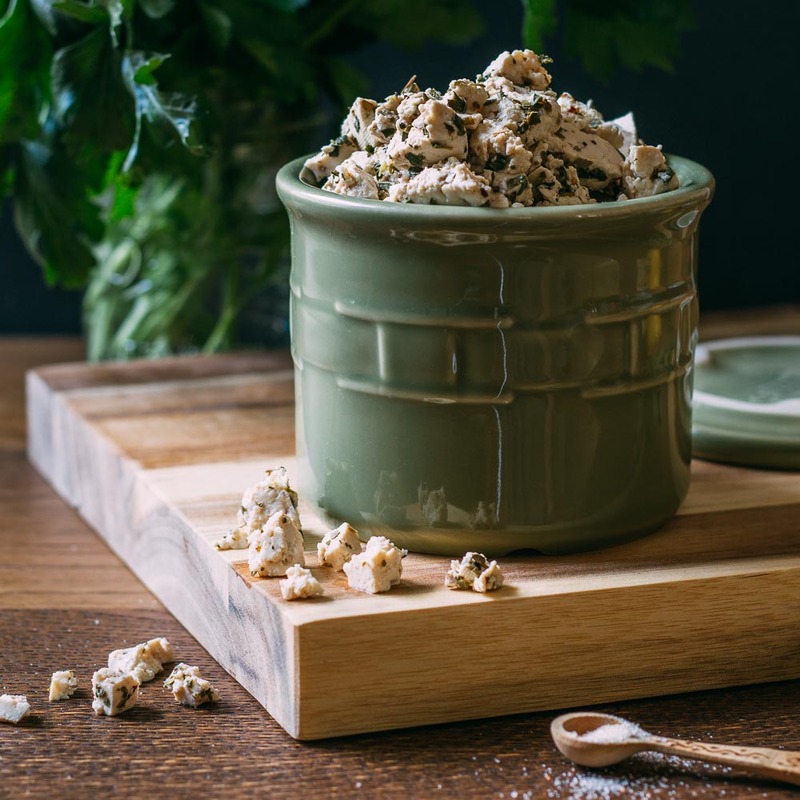 Serve your fabulous Dairy-Free Tofu Feta Cheese with crackers, raw veggies, and tasty olives as an appetizer or toss it into your favorite salad for an added bit of zest and protein. The tangy taste of my Dairy-Free Tofu Feta Cheese suits me perfectly. But if it is too briny or tangy for your liking, reduce the vinegar and increase the water as needed. Ultimately, the brine creates the flavor that will be absorbed by the tofu. Be sure to taste the marinade/brine and adjust to your liking before adding the crumbled chunks of tofu. The leftover brine makes a great salad dressing. Fantastic suggestion, Darlene – thank you for sharing your delicious discovery!